Looking for an all-purpose blade that’s affordable yet refuses to compromise on quality? Then, nothing would suit you better than the Kershaw Link. The high-quality materials, foldable design and ambidextrous comfort are what makes it a winner in our eyes. Most blade enthusiasts, like ourselves, are constantly on the lookout for that perfect knife that functions both as a survival tool as well as a self-defense tool. This can be tough, we find blades the suit one function perfectly but fall short in other areas. That is until we found the Kershaw Link! This blade is an all-purpose tool that can perform a wide variety of tasks such as cutting wood, deboning fish, skinning rabbits as well as self-defense situations. The sturdy and high-quality steel blade and the Aluminium handle grants the knife its durability and strength. The Link was made in the US and boasts of being a link between quality and affordability, which we can certainly attest to. When put to the test, the Link outshines many of its cousins from the Kershaw family as well as other knives. Read our full Kershaw Link Review and find out why we believe this is an excellent all purpose tool. 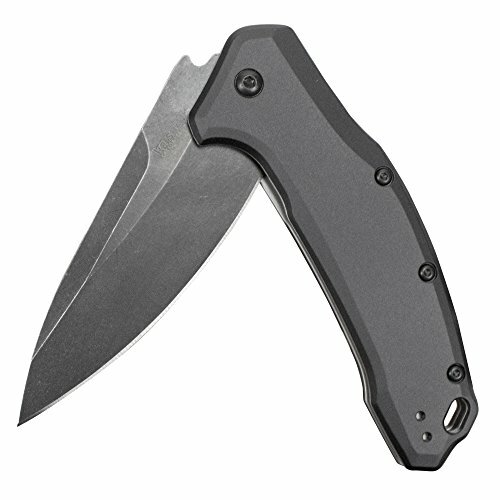 The Kershaw Link boasts of the following unbeatable features. The blade of the Link has a drop point style and uses mid-range stainless steel that holds a nice edge. For all the steel enthusiasts out there, the blade of the Link is 420HC and it 3.25 inches. 420HC is a good steel for an everyday carry knife, it hard enough of hold a good edge, and it has corrosion resistance properties to help prevent rusting in the event you can’t clean your knife right away. So while it may not be a premier steel, it’s still plenty durable and rugged for use in the outdoors. Additional blades styles are available and include Tanto and a half serrated edge. Depending on your handle material you prefer the blade colors will vary. The handle comes in a variety of three types, the knife being reviewed in this article has an aluminum handle. But there are other options available below. The handle is quite sturdy and ergonomic. The handle is, however, smooth and thus might get slippery if your hands are sweaty. The Speed Safe Assisted Opening allows you to take out and open the knife easily and quickly. All you need to do is press on the thumb stud at the corner of the knife or pull on the flipper. This is why this knife is a top option for self-defense use. You cannot fumble around, trying to open the knife when your life is in danger. The Link allows you to be quick and steady. A pocket clip is attached to the side of the knife. The pocket clip is reversible as well, so you can easily store your knife in the left or right direction or tip up or tip down direction. The pocket clip allows your pocket knife to stay secure. However, it does create tension or discomfort when you grip the knife. The liner lock is an essential feature of any blade as it allows the steel knife to lock into place once it has been opened. Behind the steel plate where the handle is attached, the liner pushes the blade outward and locking it into place. The one on the link is strong and reliable. It engages and disengages easily. The flipper is attached on the handle and it allows you to open the blade quickly. The flipper is what enables the Link to be so versatile since it allows you to counter any attacks. One of the most important features of the knife is that it boasts of being made in the good old US. This means that the knife has quality materials and features an impeccable design. Most US-made knives are too expensive, however, with the Link, you will never that its an excellent budget friendly pocket knife. The knife was actually by Kershaw’s manufacturing facility in Tualatin, Oregon. Every knife should be sturdy and durable. If it’s not, then it’s a useless tool. However, we are glad to say that the Link did not disappoint in this regard. The 420HC blade is a medium grade steel that is non-corrosive and strong. The knife can hold an edge easily. In fact, we used this knife for a month with only a few touch ups required on the edge. The overall design quality is truly American. The blade shapes are versatile. The Liner Lock and SpeedSafe Assisted Opening are durable as well, which makes the knife perfect for those who use your knives a lot. All in all, the knife is strong, durable and sharp. It is everything you want in a knife. As we mentioned before, the handles come in either Fiberglass reinforced Nylon type or the Aluminum type. The black nylon handle comes with a polished blade while the Aluminum blade comes with a stonewashed blade. The Aluminum version of the knife is more expensive than the GRN, usually costing about $10 more on the average. We found the Aluminum handle looks nicer and sleeker, however, that is its only advantage. While you might find that the Aluminum version is smoother, it is slippery as well. The GRN version, on the other hand, has added texture for a better grip. Both the handles are lightweight and strong. They are both corrosion resistant. They are perfect in terms of design and ergonomics and easily fit in your hand. Another important aspect of any knife is how strong its locking mechanism is. You don’t want your hand to slip because of a failed lock. The SpeedSafe Assisted Opening mechanism ensures the knife can be easily opening just with a flipper. This allows you to use it quickly in situations where you need to defend yourself. It uses a torsion bar that is inside the handle which you can usually overcome using a flipper. After opening, the knife is automatically locked in place using a liner lock mechanism. A portion of the liner sandwiched between the scales moves in behind the blade tang as its opened. Once the blade is fully deployed, outside of catastrophic failure, it’s impossible to close the blade until the liner is moved out of the way. When using the knife for cutting, skinning or deboning purposes, you do not want to put too much strain on your hands. This is why a knife should have an ergonomic design. The handle is quite smooth and fits like a glove into your hand. Furthermore, the flipper only requires a small amount of pressure to flip the blade open. You can easily open the blade one-handed. It is easy to operate and activate. It has a thick thumb rack that allows you to put your thumb and gives you control when cutting. The pocket clip is designed in a way to ensure no hot spots appear. The Nylon model is better in terms of ergonomics as it is lighter and has a better grip. It is warmer as well. The Link is an everyday carry knife that has a pocket clip that enables you to carry it easily inside the pocket. 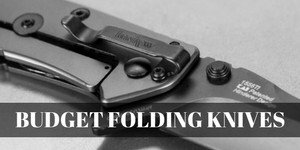 The pocket clip is however not a deep pocket carry, which deducts a few points on the overall performance. However, it is sleeker which enables a more ergonomic carry. The knife is heavy as well, weighing at 4.2 ounces for the nylon version and 4.8 ounces for the metal version. The closed length is about 4.4 inches which are bulkier than most pocket knives. The reversible pocket clip allows you to carry the knife in all positions. First, we pitted brother against brother! The Kershaw Link outshone due to its sleek and stylish outlook. The pocket clip on the Skyline is too stubby. The ergonomics are much better on the handle of the Link. The Skyline, however, does weigh lesser at 2.5 ounces. It has a Sandvik 14C28N blade which performs much better than the Link. It is much easier to carry due to its shorter size and lesser weight. Apart from that, they both have the same locking mechanism and reversible pocket clip. The Kershaw Link and Spyderco Tenacious both have a liner lock and the 4-way pocket clip. Both are also priced in the same range as well. However, that is where all the similarities end. The handle of the Tencious is made from G-10, which is one of my favorite handle materials. It provides an excellent grip and can be very ergonomical for long hard use. I don’t have much bad to say about the Tenacious. However, the Tenacious is a knife that is made in China and does use cheaper blade steel. All in all, the Link is one of the best knives we have encountered. It is certainly versatile and allows the user to carry it around daily. We highly recommend you give it a try!